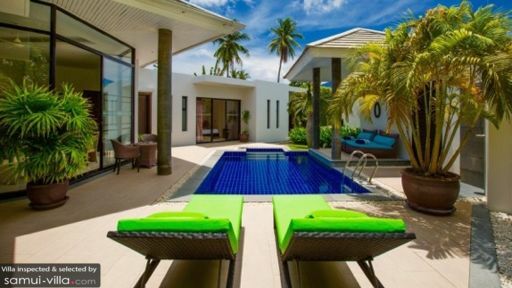 For comfortable, tropical living, look no further than the alluring property of Horizon Estate where you have villas such as the three-bedroom Villa Tongsai Grove, amidst other boutique villas on the pristine Choeng Mon beach. Featuring wide, open spaces, a chance to enjoy the fresh air while relaxing by the pool and relishing a feast under the starry-night sky, the villa is the height of holidaying in the tropics. Head outdoors to explore neighbouring Chaweng with its popular beachside restaurants and bars or visit the famous Big Buddha Bophut for stunning pictures. There are three identical bedrooms at Villa Tongsai Grove designed for comfort, ease and familiarity. With king-sized beds, a rattan sofa-chair and vibrant interiors, the bedrooms will soon become your personal haven after you’ve had a long day of exploring Samui’s many sights and special sounds. The bedrooms are air-conditioned to give you a cooler and more welcoming ambiance during hotter hours of the day. Ensuite bathrooms accompany each of these three bedrooms that have been fitted with spacious showers. Two bedrooms open out directly to the poolside so you have direct access to the deck whenever you please. 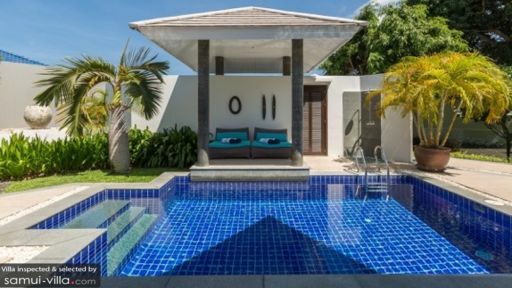 Villa Tongsai Grove is a gracious property with a massive outdoor area that is occupied by a mosaic-tiled swimming pool with ultramarine-blue water. Guests can enjoy a relaxing afternoon dozing off on the sun chairs or under the poolside sala that has lined with comfortable daybeds. Lather on your sunscreen to keep from getting a sunburn and have yourselves a ball playing in the pool, firing up the BBQ and having a meal on the alfresco rattan dining area. 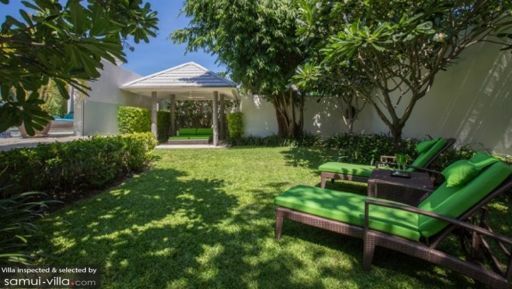 A luscious, well-kept garden is found adjacent to the deck, perfect for your morning yoga or meditation session. Separated by floor-to-ceiling glass doors stands the main living pavilion at Villa Tongsai Grove that has been furnished with fluorescent green sofas and vibrant décor for a cheerful and bright ambiance. The modern space is decked out with amenities like a flat-screen TV and DVD player to serve as your entertainment. It has been decorated with simple things that occupy the coffee table or cabinets to focus more on comfort and easy-going aesthetics. You have the luxury of relishing your meals wherever you so well desire. There is an indoor dining area for six as well as rattan outdoor dining area on the sundeck. Whether you are in the mood for a BBQ or fine meals prepared in the fully-equipped kitchen, you are never out of options at the villa. The kitchen is ready to accommodate all your needs and special requirements with modern fittings and appliances to help you prepare the dishes of your choosing. As part of a well-managed estate, Villa Tongsai Grove goes above and beyond to offer guests an unforgettable experience. While you reside in the most popular part of Samui, the staff will look after all your needs and keep the villa well-maintained. They are all too ready to make any bookings on your behalf and even offer suggestions on what to do in the area. Villa Tongsai Grove is found on Choeng Mon beach, which is one of the most popular parts of the island with many restaurants serving delicious Thai and fusion food, ancient temples like Wat Plai Laem, and the famous Big Buddha in the Bophut area. A further away is the popular Chaweng beach with activities like Treetop Zipline and beach clubs like Green Mango and [email protected].